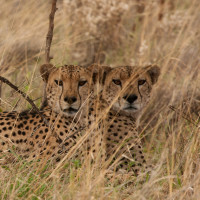 When you are lucky enough to spot a cheetah (scientific name: Acinonyx jubatus raineyi;Kiswahili name: duma), you typically see a ‘little’ head (well……for a cat of that size ‘little’) sticking out of tall yellow grass under a shady acacia or balanites tree. If you are really lucky, there is a second ‘little’ head sticking out nearby. While conducting our desert warthog survey on the edge of Kenya’s remote Chalbi Desert we had a very different encounter with the majestic cheetah…..
During our research to better define the geographical range of the desert warthog in northern Kenya, we use every opportunity to collect data on other taxa present in this dry and relatively poorly known region. 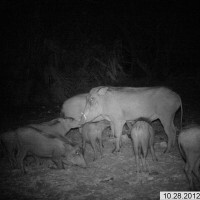 The nights, in particular, provide new and interesting findings…and, this time, we are not talking ‘pigs’ (see our two earlier blogs). In our search for warthogs in central northern Kenya, we drive from Marsabit, across the Koroli and Chalbi Deserts to Sibiloi National Park (just south of the Kenya – Ethiopian border). It is the end of the dry season in a region where the annual rainfall averages just 250 mm per year (and in some parts it may not rain for several years). There are two species of warthog, the common warthog (scientific name Phacochoerus africanus) and the desert warthog (Phacochoerus aethiopicus). 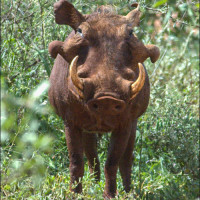 The better known of the two, the common warthog (indeed… ‘Pumba’ in the ‘Lion King’), is widespread in sub-saharan Africa, including the Horn of Africa (i.e., Kenya, Somalia, Ethiopia, Djibouti, Eritrea)…. 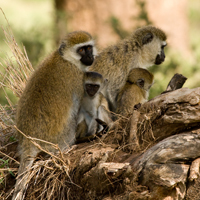 Have you seen patas monkeys in Laikipia in the past two years? 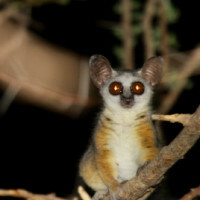 We would appreciated a record of your sightings!